N3 expanded their global marketing and technology business to the WV Regional Technology Park. 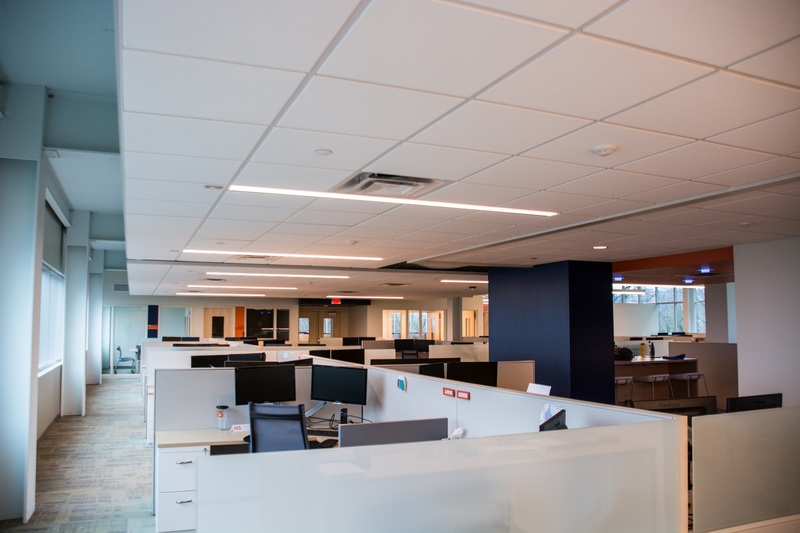 This tenant fit-out focuses heavily on their brand and culture, and design of the South Charleston office was loosely modeled after their Atlanta headquarters. 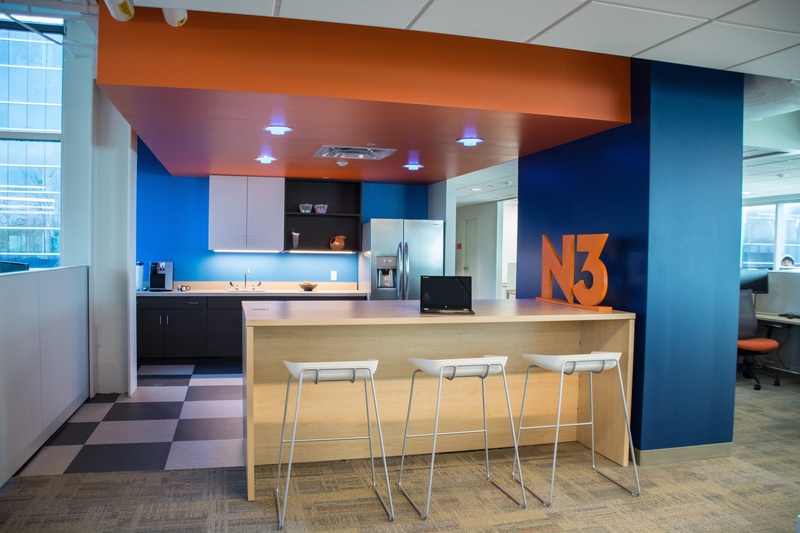 Upon entering N3’s main reception area off the elevator lobby, the brand is immediately evident, from the orange logo, bright blue wall, and both orange and blue accent carpets. 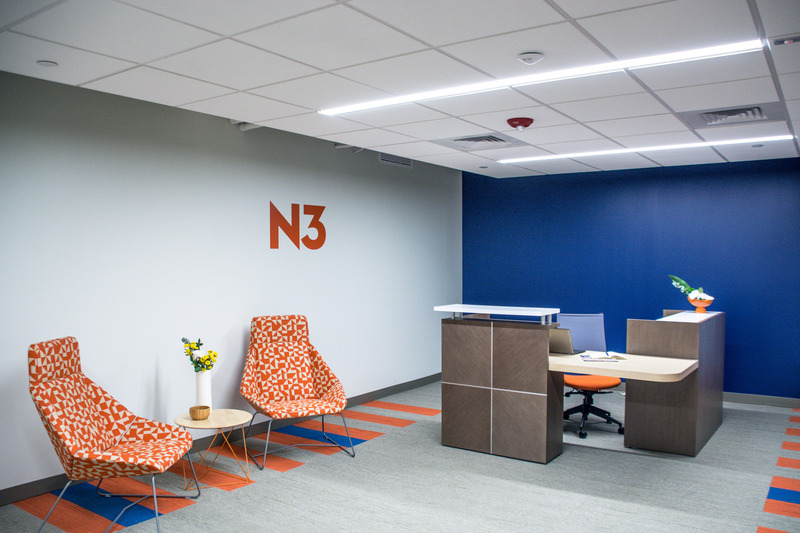 Even the angular lounge chairs show off the simplicity of N3’s logo with a fun, geometric orange pattern. The reception desk combines walnut and light maple woods with white surfaces, a combination seen throughout the office space. Even the angled wood grain on the front mimics the angle of the “N”…details become so important when communicating a brand. One of the largest open work areas in the office features 13-foot high open ceilings and tall windows. The pendant light fixtures provide mostly diffuse downlight, with about 10% uplight, so the ceiling appears bright. 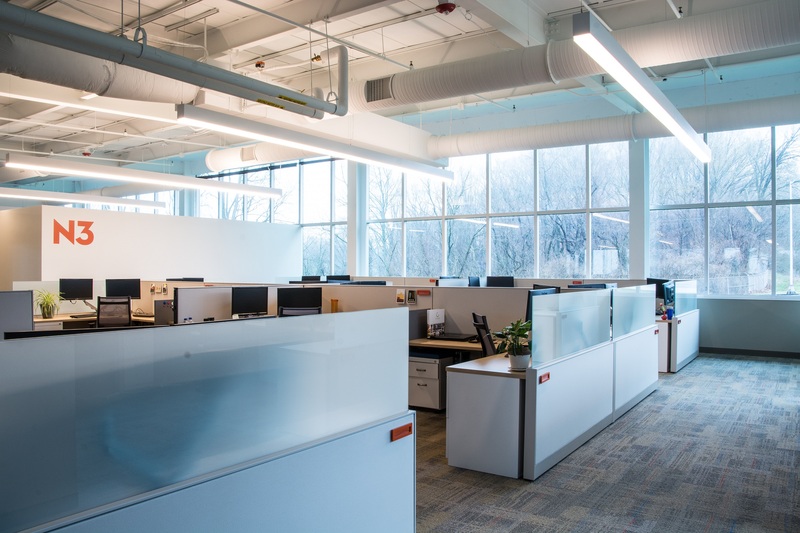 They are LEDs and have both daylight and occupancy sensors built in: they automatically dim based on the amount of sunlight coming in through the windows, and will automatically turn off after a time of no movement in the space, such as on the weekends. These features have a direct effect on N3’s electricity bills. In other parts of the office, daylighting and views add interest, variety, and a sense of openness, even with a lower acoustic ceiling. The workstations are modeled after furniture in the company’s Atlanta headquarters; this furniture is manufactured by Steelcase. 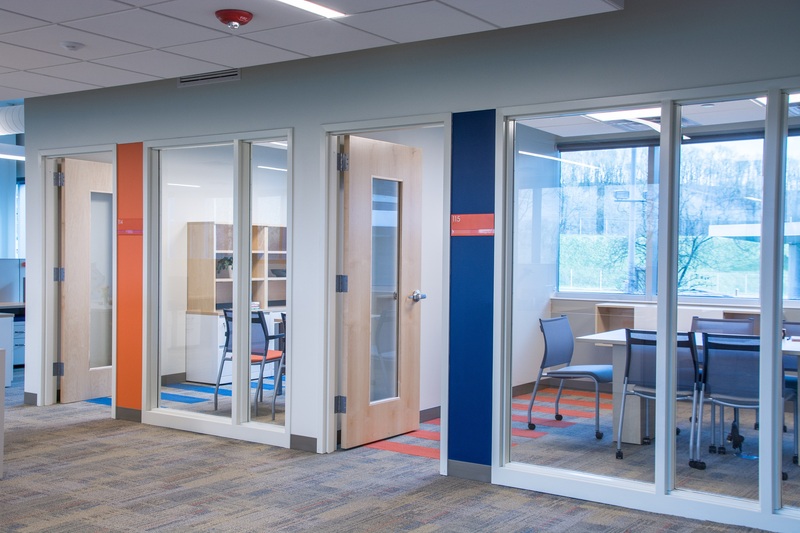 Each area and group of workstations also have a private office and small meeting room. 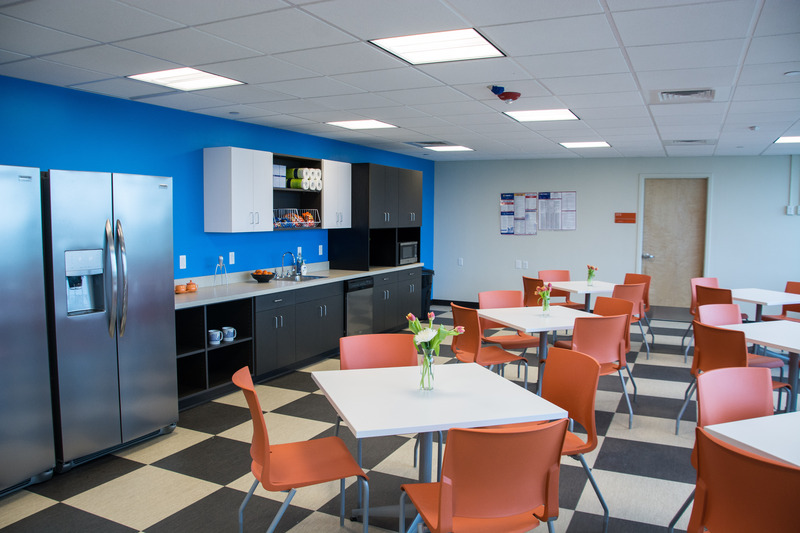 Each area has its own level of security based on the types of clients N3 has, so each area also has its own kitchenette, with a refrigerator, sink, and cabinetry, so employees can easily store their lunches, make coffee, etc. In this case, there was plenty of square footage to add a “third space” where employees can have lunch, an impromptu meeting, or work away from their desks for a short period of time. All kitchenettes feature the orange drywall ceiling, blue accent wall, and the white, cream, and gray color scheme for the floor and cabinets. For those times when staff need to get away from their desk for a while, a large lunch room fits the bill. This room also has lots of windows and a private Mother’s Room adjacent for nursing mothers.